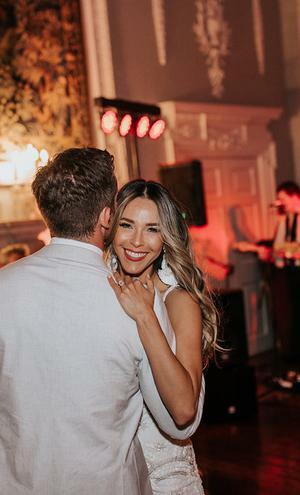 Aissa Widle and Kevin Duffy met in Las Vegas in 2015, and were engaged two years later while on holiday in Mexico celebrating Kevin's birthday. They had taken a boat out to the private Majahuitas beach with friends and when they got there their pals set them up to take a few photos. Before Aissa knew it, Kevin was down on one knee on front of everyone. "There was tears and laughter and I said yes!" she says. 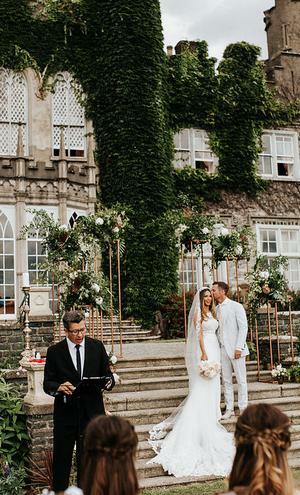 The couple from Orange County in California decided on a destination wedding in Ireland to honour the groom's family heritage and after visiting Ireland a number of times, knew a castle would be the perfect venue for their nuptials. "After we got engaged we set up a trip specifically to look at five Irish castles," says Aissa, "yes we went castle shopping!" 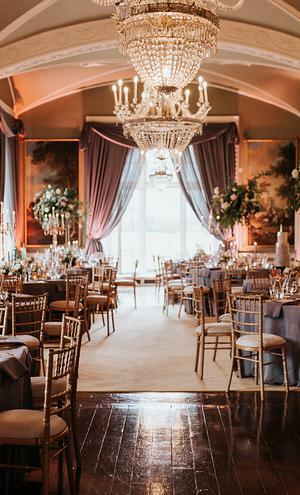 They eventually settled on Luttrellstown Castle in Dublin, the fact that they could hire the castle exclusively for a private, relaxed occasion with just their own friends and family sealed the deal. 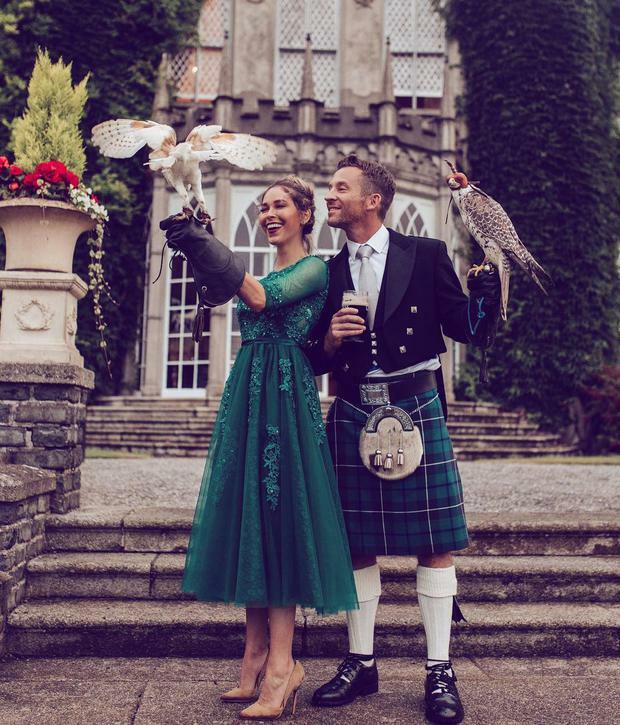 The night before their big day they held a special rehearsal dinner which saw Aissa donning a beautiful emerald green tea length gúna and Kevin in a slick traditional kilt. 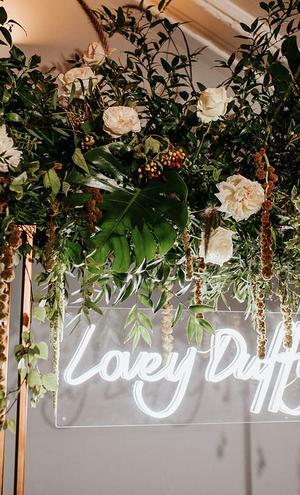 As soon as they decided on a destination wedding, Aissa says, they hired a planner - Michelle at Waterlily Weddings - to help them to pull it all together. 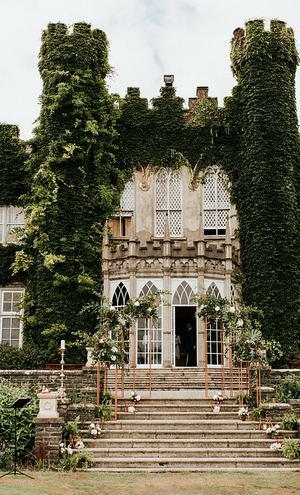 While they didn't feel the need to create a theme as such for the day, the couple enlisted the help of Sharon at Frog Prince Weddings to create a modern feel within the castle's elegant, olde-world setting. 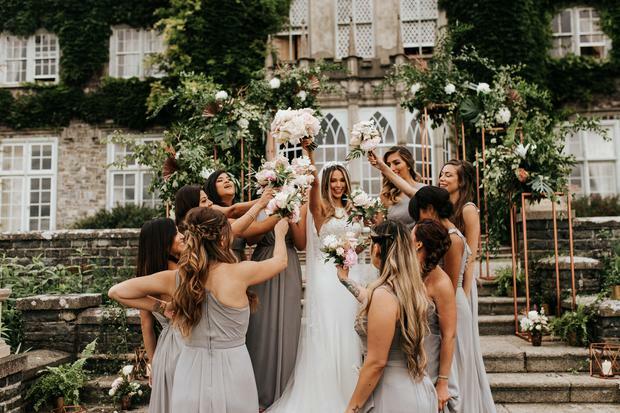 "I wanted to incorporate the castle’s vintage aesthetics with modern elements," explains Aissa, "and Sharon did an amazing job of drawing in vintage pieces with modern design, mixing rose gold candelabras with gold geometric centerpieces and rose quartz accents." 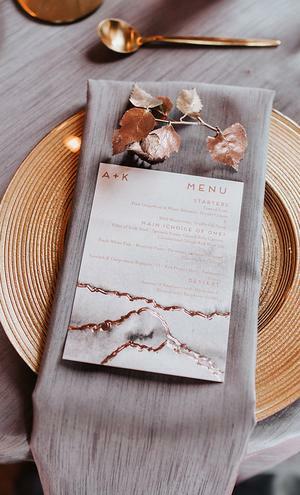 As a blogger, Aissa included lots of elements into the day to personalise her wedding, including a custom leather jacket which she wore out and about in Dublin city centre when the couple arrived in Ireland. These photos from the day are by Sydney Bliss and video is by B&G Films. Shopping for a wedding dress was a lengthy process for Aissa - she tried on at least 50 gowns before finding 'the one'. 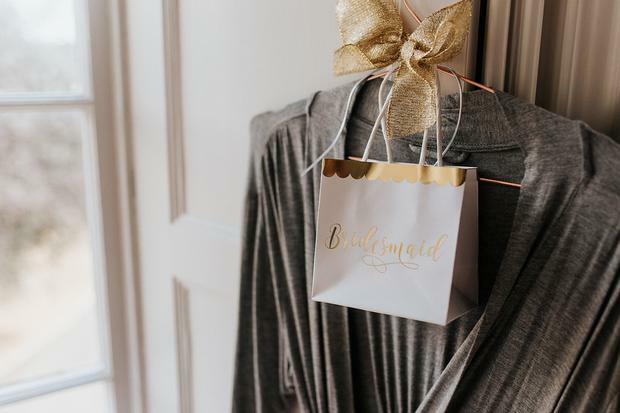 "I must have visited 10 bridal shops," she says. "I finally chose a beautiful gown by Martina Liana at a bridal boutique in California. I liked that the gown was made with a combination of lace, tulle and Bellagio Crepe but what made me fall in love with it was the trains decadent lace edge dealing." Kevin wanted to wear something fresh and modern, so he opted for off grey colored custom suite from the Suit Supply. 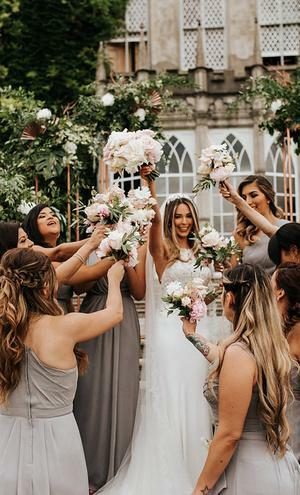 Aissa had ten bridesmaids in her bridal party, and given that they came from far and wide (namely Texas, California, Florida and Puerto Rico) finding somewhere they could all get to to ry on some dresses was priority number one. 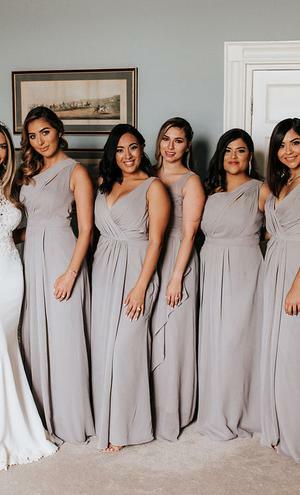 The girls wore simple grey chiffon gowns which they got from David’s Bridal. The couple had Spiritualist ceremony presided over by celebrant Pat Mangan of Spiritual Ceremonies. "It was important to us that we incorporated God in our union," explains Aissa. "Our first reading was an extract from First Letter of St. Paul to the Corrinthians. Another important detail for the couple was to include some traditions in the ceremony - "we performed the tradition of hand fasting, blessed our rings from the water of the Shannon River and with sand from a beach near our home in California and included the lighting of the unity candles." 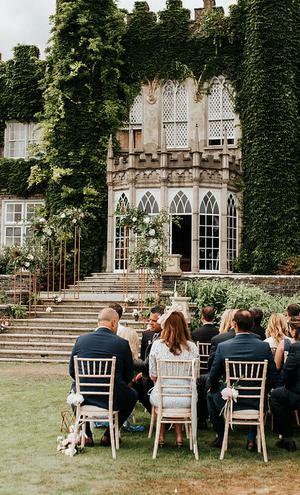 The couple went 'castle shopping' before deciding on Luttrellstown in Dublin, and had looked at Ashford Castle, Glenlo Abby, The K Club, Luttrellstown and Waterford. 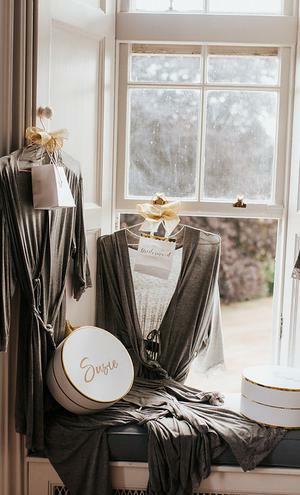 "They were all beautiful and picturesque but what was unique about Luttrellstown is that it would be exclusively ours for our wedding night," says Aissa. 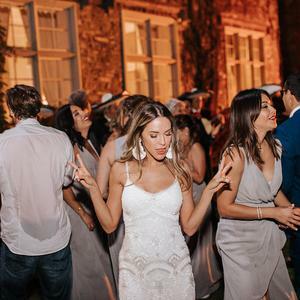 "With twelve newly renovated rooms for our family and friends to stay in we knew it was the perfect venue and that was the deciding factor in choosing 'our castle'." 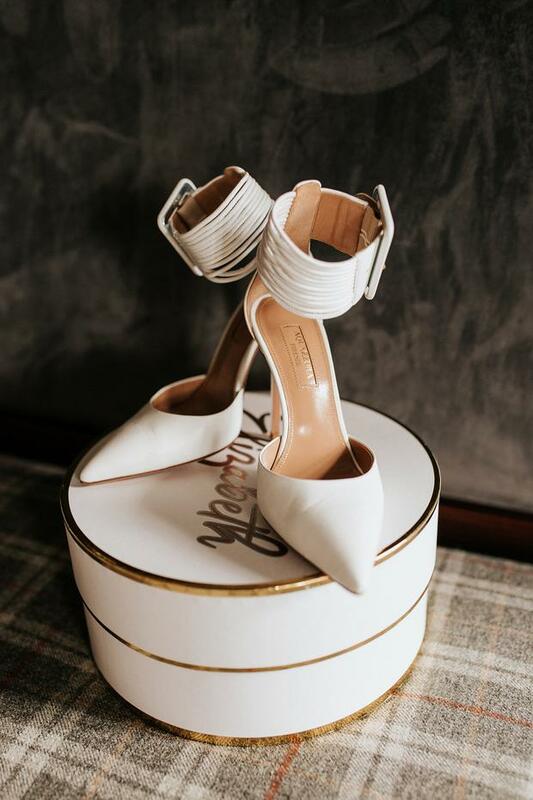 For the bride, the speeches were the stand-out moment of the day: "I had held it together all day but when Kevin gave his speech at dinner I could not hold back the tears of joy," says Aissa. "His words were; Ireland is a magical place, I think it’s a lot like Aissa, it’s a beautiful land, it’s super kind people, there’s joy everywhere and it’s a place where everybody is always invited and I feel like Aissa’s a lot like that, she invites everyone into our lives and it’s changed my life for the better because of that.” Other moments that come to mind for the bride were when her mother walked her down the aisle, their friends taking tequila shots and the surprise mariachi band that started up at midnight, "but most of the alone time I got with when Kevin when he and I walked to a close by field to take photos while the sun was setting," she says. 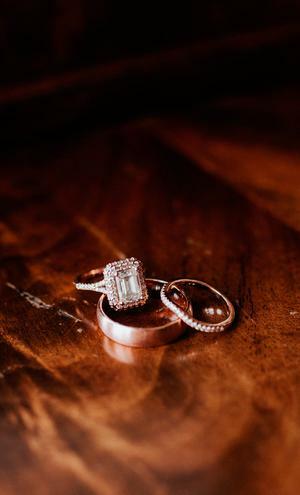 "Get a wedding planner," says Aissa "get them from the beginning to the day of and have them stay the entire time! Communicate every detail with your planner, what you envision, expectations and get their advice on logistics. I was hundreds of miles away so if it wasn’t for our wedding planner Michelle at Waterlily Weddings I would not have enjoyed planning it. The best decision we made was to hire a planner first thing after we decided to have a destination wedding, they were there every step of the way helping me bring my vision into a reality. Also, don’t forget add your special touch, we did a mix of Irish and Mexican music." Aissa and Kevin honeymooned in Venice and the Almafi Coast in Italy and spent a few days in Greece - "It was magical."